Is the action a distraction? If this is all viewers see, do your advertising dollars stack up? Gaze data showing what elements of the starting scene viewers actually looked at. Brands can pay millions to secure a spot amongst the action at major sports competitions. They’re paying to piggyback off the popularity of players, teams and events which, in some cases, have a cult following – they’re paying for what you might assume is a guaranteed audience. But is it guaranteed? Just because a brand is before your eyes, do you see it? In the leadup to the Winter Olympics, snow sports have been front and center on television sets, computers and smart screens. So Tobii Pro Insight thought the time was right to see how effective the banners, flags and fixtures are at attracting attention and leaving a lasting impression. Twenty people were asked to watch a Eurosport clip of one of Ted Ligety’s Giant Slalom runs, which helped deliver him a World Cup Podium place for the first time in over two years. A screen based eye tracker was used to register how many participants saw various advertisements, how many times they saw them, and for how long they looked. This was then followed with a questionnaire to determine the level of brand recall. 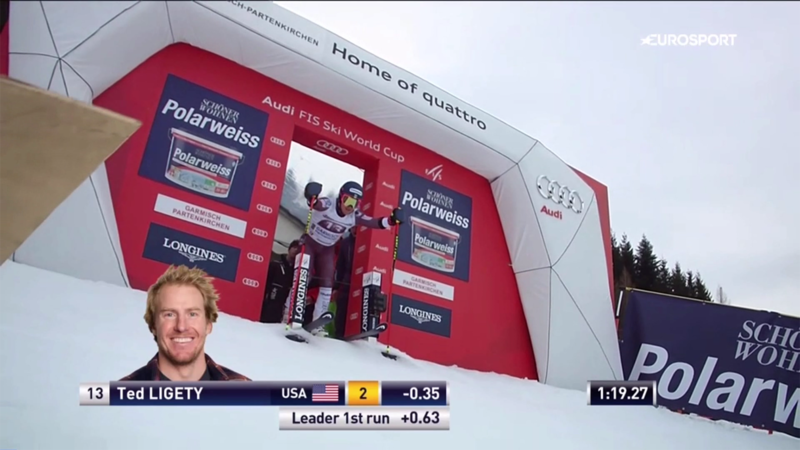 The starting gate appeared on screen for close to 10 seconds, yet people were so heavily focused on Ligety, they barely looked at the plethora of big name brands surrounding him. Despite their prominent placing the giant Polarweiss ads were seen by just 20% of participants, and of those, none remembered them afterwards. The smaller Longines logos were seen by just 10% of participants, while the multiple Audi logos faired a little better and were seen by 30% of viewers. Based on this it’s clear people were so absorbed in their anticipation for the event, they weren’t receptive to the advertising. 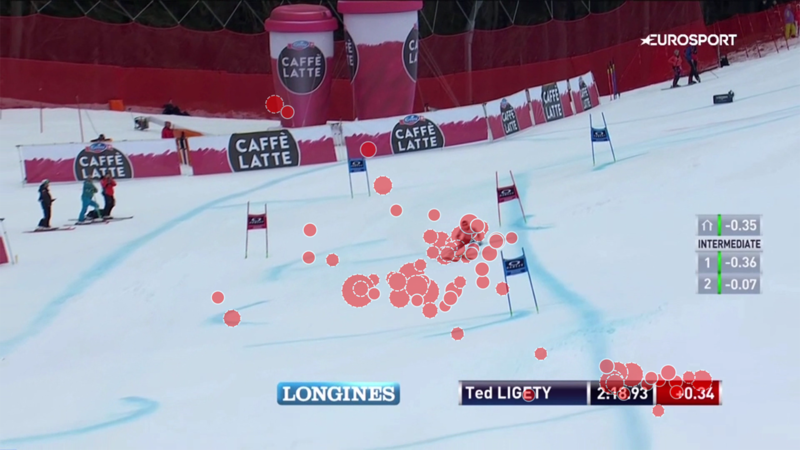 As Ligety powers down the slope multiple big-name brands flash past. It appears as though they’ve been positioned to take advantage of a slowing of speed as competitors round corners, but again, most viewers were so absorbed by the action, they didn’t notice the ads. There were mixed results for Swiss beverage brand CAFFÈ LATTE which had erected two giant coffee cups resembling their products alongside the course. 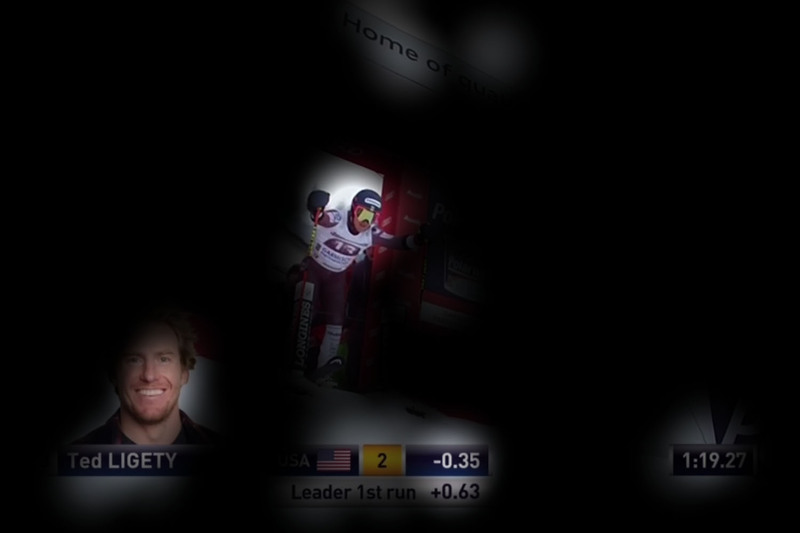 They were visible on screen for about 15 seconds, and as Ligety whizzed past 50% of viewers noticed them. However, the average time each person spent focused on the ad was just one fifth of a second; a behavior which could explain the fact no one was able to recite the brand name afterwards. Gaze data showing snapshot of the event and viewers’ attention. So what WAS effective you might ask? Well, the research indicated repetitive smaller advertisements performed well. The Oakley banners attached to the course gate poles appeared many times throughout the clip and were viewed a total of 86 times. So what’s the takeaway? There’s no doubt ads and branding at sporting events work, and of course they will be received by different people in different environments and platforms with varying degrees of success, but this study highlights the benefits of eye tracking as a research method when working out how to allocate your valuable advertising spend. An eye tracking study can reveal areas of high visibility, and other useful information you can use to your advantage. For example, one might have assumed the exceptionally large CAFFÈ LATTE cups might, by default, have attracted more significant attention simply because they’re easier to spot, but in actual fact they didn’t – bigger isn’t always better. The same could be said for the starting gate, where the camera is focused on that one area and the race is yet to begin, but again, while people were looking at a screen containing the ads, they did not actually focus on them to the degree you might expect. 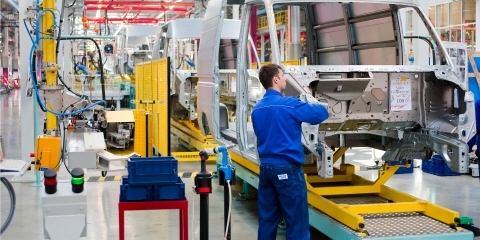 Using eye tracking to measure the effectiveness of signage and advertising is an established method which has been used to assess the effectiveness of material in various environments for many years. Global media company Clear Channel used Tobii Pro Insight to examine how well their digital advertisements in the Swedish subway system worked. This method used eye tracking glasses, rather than a screen based eye tracker, to measure how much of the ad content commuters absorbed. 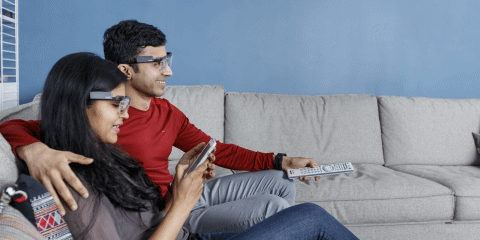 Similar studies have been performed for Facebook and Google, examining how viewers split their attention across various devices while consuming media. 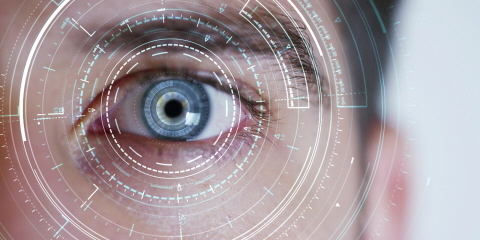 Regardless of your interest area, eye tracking is a valuable tool which gives you unique insight into how people interact with your ads or content.